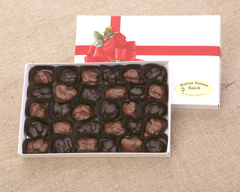 This is almond country, and chocolate almond clusters are easily the most popular of the chocolates. So here it is, an economical but very tasty and healthful box of equally divided Old Dutch milk and French Vanilla dark chocolate almond clusters. 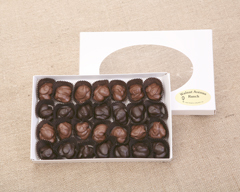 Note: we cannot ship chocolates from April thru Oct. due to hot weather. Our nut clusters box is sure to satisfy all nut and chocolate lovers, as it contains a combination of milk and semi-sweet chocolate almond, cashew, pecan, and walnut clusters. Seasonal boxes. 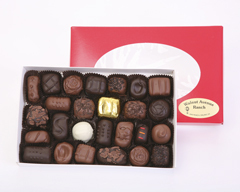 Note: cannot ship chocolates from April thru Oct. - too hot! The sampler is a pleasing combination of traditional favorites such as nut clusters (almond, pecan, walnut, cashew, walnut/marshmallow), but also contains a few surprises such as muddy snowballs, dipped apricots and pineapple wedges, and almond butter creamcups. 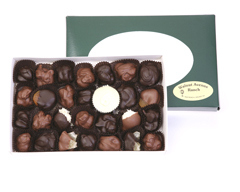 Note: we cannot ship chocolates from April thru Oct. - too hot!